All Aboard Records' pop-punk bands All Or Nothing and Chaos Days recently teamed up for a split EP and decided to hit the road together to support it. It should be a good way for Chaos Days to get more listeners, as the Brighton guys aren't very famous compared to their label mates. Their pop-punk is soft, filled up with good melodies and the dual vocals on songs like 'You and I' give a good energy to their music. Maybe they could use them more to differentiate themselves a bit more, as their big choruses and bouncy rhythms are well-executed but predictable and classical. 'At Heaven's Gate', the other track featured on the split, is less tasty live but remains pleasing due to the great work on the guitars. The band also include songs from their debut EP 'Under the weather' to their set, which enables us to witness the four-piece band's progression. Their friends All Or Nothing keep everyone entertained with their edgier pop-punk driven by power chords and catchy vocals. The band alternate between their different releases, including songs from their split with American act The Wonder Years. The new songs are the most impressive though, especially the less poppy 'Don't Do This' and its heavy leading bass. Overall, they make a good impression, trying their best to make the audience get involved and spreading a good energy. A promising set. Just like both bands, this was a simple and quality live show. In the end, All Or Nothing and Chaos Days' pop-punk could rival its American equivalent. 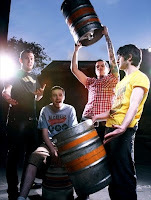 They are the proof British pop-punk is growing and getting better.